The discovery of a new gem is always extremely interesting and scientists throughout the world are always anxious to know the gem’s analysis, its various properties and in what form nature has produced her latest novelty. 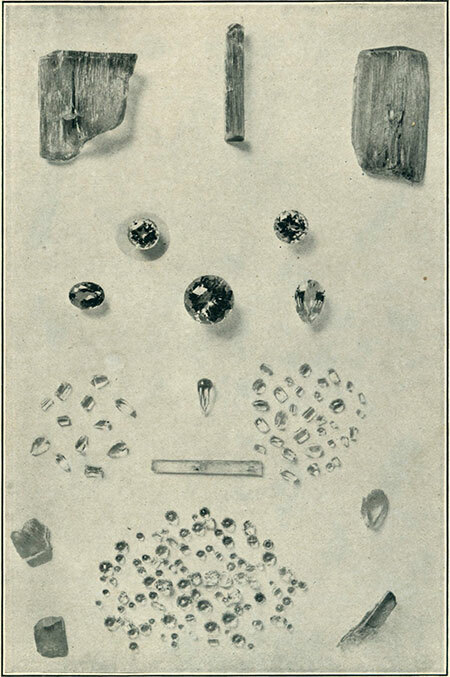 At present the most remarkable gem in which the world generally, and scientists in particular, are interested belongs to California, and was first found about three years ago on a mining concession, owned by Frank A. Salmons, in the Pala mountains of San Diego. It was called “kunzite” in honor of Dr. George F. Kunz, who is widely known as an authority on precious stones. 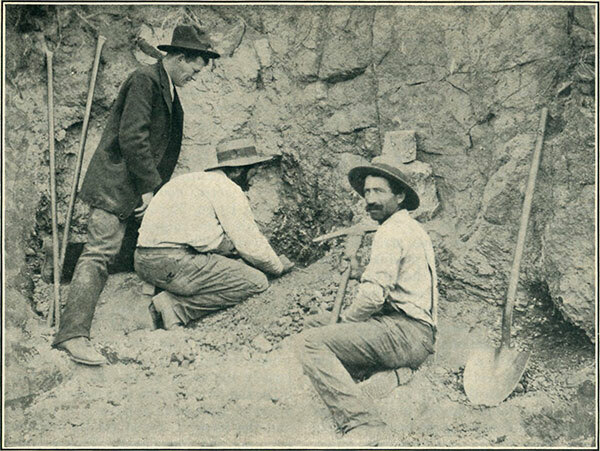 Bernard Hariat, Pedro Fiflet, and Frank Salmons, discoverers and owners of Pala Kunzite Mine in San Diego County, California—the only deposit of its kind in the world. The comparatively recent discovery of large deposits of lepidolite, amblygonite and tourmaline in the Pala mountains leads mining experts to believe that undoubtedly other rich minerals will be found there. This range lies within easy walking distance of the one-time famous mission which the government has lately converted into an Indian reservation and may be reached easily by train and wagon road from Oceanside. Kunzite was not a very romantic or poetic name to select for such an exquisite specimen of nature’s handiwork, but those who have made precious gems a study and are indebted to Dr. Kunz, the author of “The Gems and Precious Stones of North America,” for much of their knowledge, cannot but feel that he richly deserves the compliment. 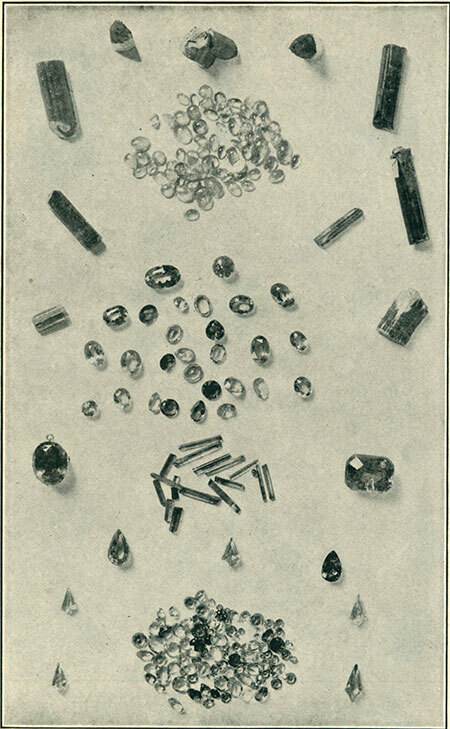 The name was suggested by Dr. Charles Baskerville, professor of chemistry in the University of North Carolina, who with Dr. Kunz has made many interesting experiments with radium and electricity of the wondrous gem from Pala. That there is nothing new under the sun is again proven in the discovery of kunzite. Scientists were puzzled for a time to locate properly this beautiful heliotrope-colored crystal, but it did not take them long to trace its kinship with the opaque spodumene found in South Dakota and in one or two of the New England states, and the lithia emeralds (hiddenite) found in North Carolina. Spodumene is composed of a silicate of alumina, lithia, soda and one or two other minerals and is constitutionally complex and quite liable to alteration. Such specimens as have been found heretofore were of poor quality and had little or no luminosity. This caused the gem to be looked upon by experts as a degenerate, and only by the occasional discovery of a piece that had not been totally disintegrated was some idea given of its former brilliancy. The finding of the Pala spodumene has changed all this and scientific reports on this crystal will have to be rewritten, as the kunzite spodumene is scientifically without a flaw. A yellow tourmaline crystal, weighing 14,880 karats, from the Mesa Grande Mine (about half original size). The finest specimens of kunzite that have been found thus far are owned by Tiffany & Company, J. Pierpont Morgan, U.S. Grant, Jr., Governor Pardee of California, the American Museum of Natural History, and the British Museum. That this gem has many peculiar qualities has been proven by many scientists. After subjection to the X-rays of high penetration it remains apparently unresponsive, but upon removal to a dark chamber a luminosity appears, which is unlike anything heretofore noted in other precious stones. When submitted to the action of emanations of radium bromide this luminosity is even more pronounced. Professor and Madam Curie of radium fame, were especially attracted to kunzite on account of this unique quality. Some diamonds also have this quality but it is not so marked. The colors in kunzite are more brilliant than those found in any other known gems and vary according to the cutting, depth and action of other lights upon it. The most beautiful show a deep lilac or heliotrope tinge, which shades away to a blushing pink or pale purple. The finest and costliest collection of these gems to be found anywhere are those shown by Tiffany, and that world-famous house is willing to buy about all the kunzite that Mr. Salmons may find. The Tiffanys cut and mount about ninety per cent of these gems and in their catalogues some of the finest are quoted at prices ranging as high as the diamond, emerald and ruby. 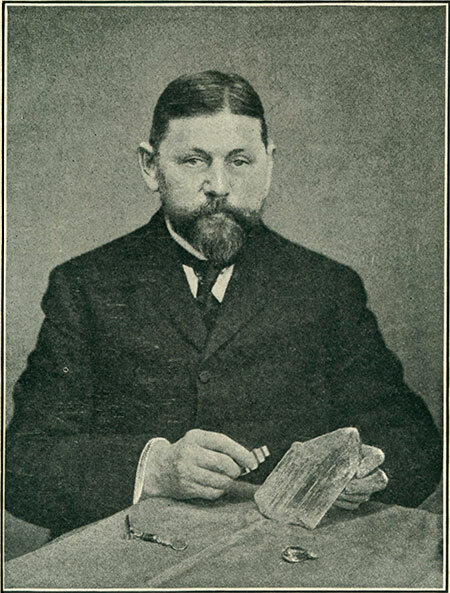 Dr. George F. Kunz, for whom kunzite, the new California gem—rival of the diamond, sapphire and amethyst—was named. Owing to the size of the crystals in their native state this gem admits of cutting in all forms and shapes and some of the La Vallieres are valued at a thousand dollars and over. Kunzite also matches well with diamonds and is attracting the attention of the world of fashion in such combinations for brooches, chains, rings, scarf and hat-pins. Just how much kunzite will be found it is difficult to state. At present the supply does not equal the demand and the mine-owner is obliged to curtail his orders. Lately, a noted firm of London jewelers placed a big order and the owner is also corresponding with jewelers in Paris, Berlin and Vienna, who are anxious to obtain exclusive control for these cities. If the supply does not run out there is no doubt that kunzite will continue to grow in popularity and the gem will in time become a valuable asset among the crown jewels of the old world. C. W. Ernsting, the lapidary of San Diego, has had much to do with the successful introduction of this new California jewel. He has been greatly interested personally, in bringing the gem to the attention of experts throughout the world, and he has on exhibition a fine collection of both the cut and uncut crystals, which he shows to many visitors. The Salmons’ mine may also be visited, but a special permit from the owner is necessary as the place is strongly protected by armed guards who permit no trespassing. A representative of Sunset made the trip there recently with notebook and camera. The journey is not a difficult one, and the spectacle of mining for jewels is one that well pays for the effort. These crystals are extraordinary objects to the eye of the mineralogist; to see that spodumenes of characteristic form, as large as a man’s hand, but with bright luster and perfect transparency, and of the rich, delicate pink, amethystine tine, is a novel and unlooked for experience. No such spodumene crystals have ever before been found anywhere. The most interesting thing to me about this beautiful new gem is the effect of radium upon it. A few milligrammes of radium bromide brought near the piece of kunzite makes it glow with a fine, yellowish light, which does not cease immediately on removal of the radium but persists for several seconds. 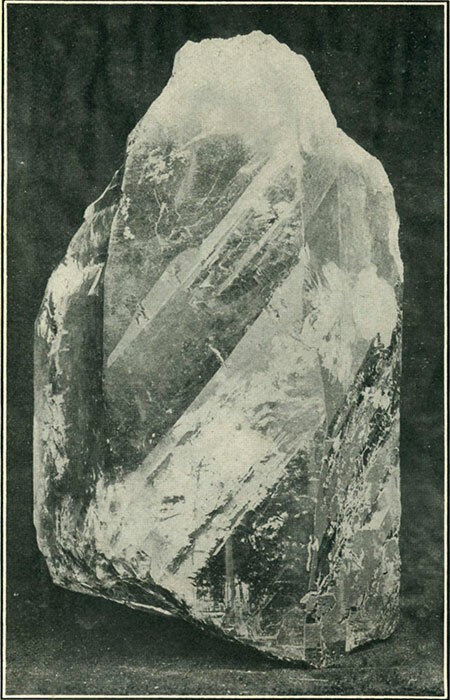 I have found some diamonds phosphoresce brightly under the influence of radium, and have been searching for a mineral which is equally sensitive. I think this lilac variety of spodumene runs the diamond very close.